Today again I have the pleasure to show you one of the MVW 2012 creations of Azul. The stunning design for Miss Venezuela 2012, Miss AnnaG Pfeffer, was made by Mami Jewell, owner and designer of Azul. The “Alba” gown is a wonderful combination of different colors and fabrics. Mami Jewell again shows that a gown does not have to be made off one color only to look elegant and sophisticated. For the evening gown of Miss Venezuela 2012, she combined black, red and a light rose tone. The rose sleeves and the collar of the top are made dreamy flexible and the huge red ribbon that parts the rose top from the black bottom is made with a high love to the detail and it looks very realistic. The black long skirt starts very tight at the hips and goes wider till it reaches the ground. The bottom end is decorated with an awesome white-silver ornament and as well wonderful flexi made. Again a masterpiece of elegance from Mami Jewell 🙂 The “Alba” gown you will find in more colors at the Azul Mainstore. 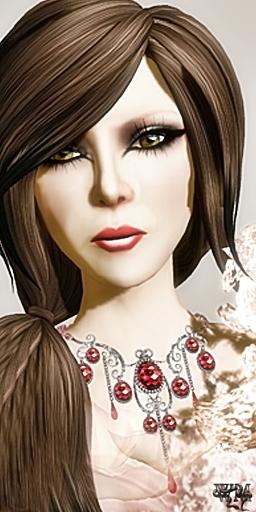 This entry was posted in Fashion, New Releases and tagged 3D, 3D people, Alice Project, Alienbear, AnnaG Pfeffer, Art, avatar, Azul, beauty, beauty peagant, beauty pegant, Blog, Blogger, Body Talking, BOSL, Challenge, Clothing, contest, Couture, Dress, evening costume, Evening Dress, Evening Gown, Fashion, Fashion in Pixels, fashion poses, Female Clothing, female wear, Formal, formal attire, Frolic Mills, Gown, Hair, High Fashion, Jewelry, LeLutka, meta virtual, Metaverse TV, Miss Venezuela, Miss Venezuela 2012, Miss Virtual Venezuela 2012, Miss Virtual World, Miss Virtual World 2012, Model, model pose, Model Poses, Modeling, Modeling pose, Modeling Poses, MVW, MVW 2012, New, New Release, New Releases, News, photographer, Pose, Second Life, Secondlife, SL, SL Clothing, SL Fashion, SL Style, Style, Virtual World, Wicca Merlin, woman. Bookmark the permalink. ← Daily Chic with PurpleMoon!